Panther's gear. Check it out! 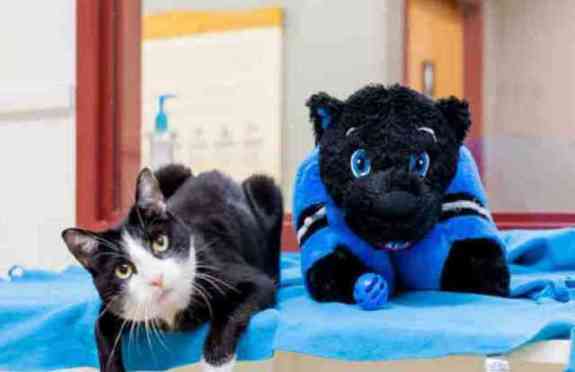 This Carolina Panthers feline fan (and her friend) is one of many available for adoption. 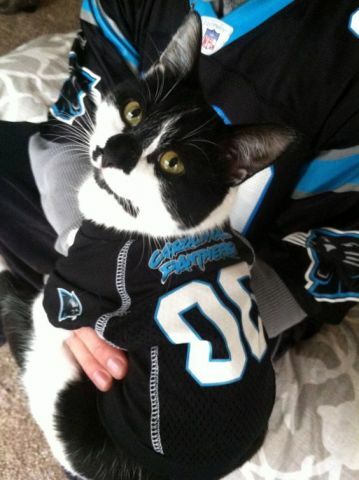 Kylie and a number of other such Panther fans are available for adoption from the Wake County SPCA in Raleigh, North Carolina. 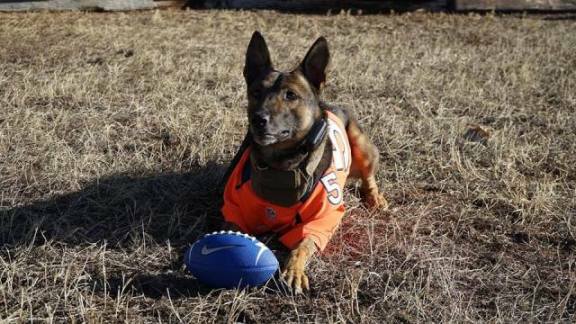 When not rooting the Broncos on to victory, Scooter is a K-9 Unit for the Douglas County Sheriff's Department. Something tells me that he is not the only fan in the department! 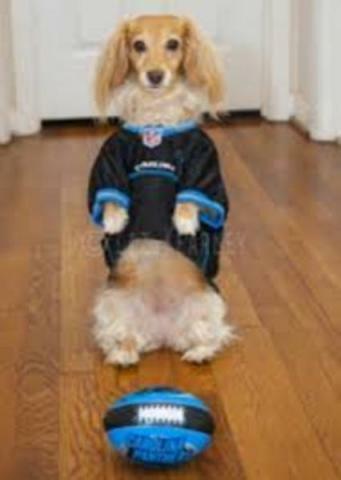 This cute canine is all about showing off his or her cute Panthers' fashion sense for the big day. It doesn't hurt that there is a whole lotta blonde involved here. 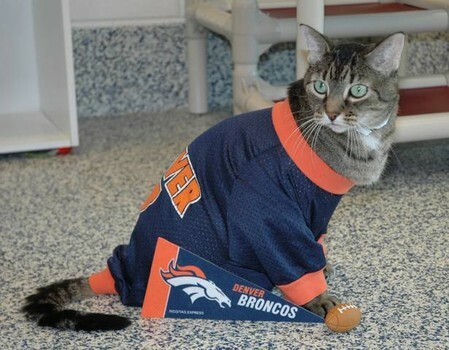 This fantastic feline is named Pinecone and she is cheering on the Broncos. We strongly recommend not bringing a new pet home to a huge Super Bowl party. Give them time to get used to their new home before so much mayhem. 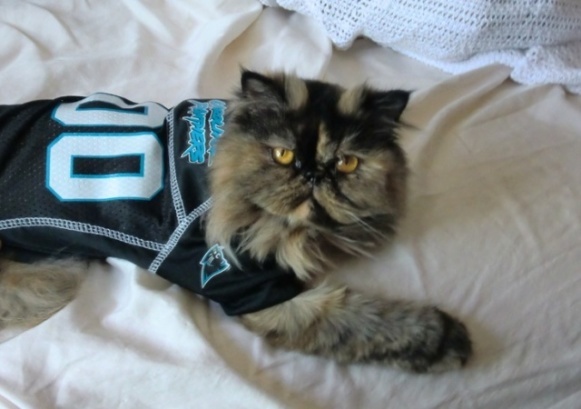 This cute cat may look like she's just lounging around, but she's on point to wake you up as early as possible on game day! Hey! That pot of chili isn't going to make itself! 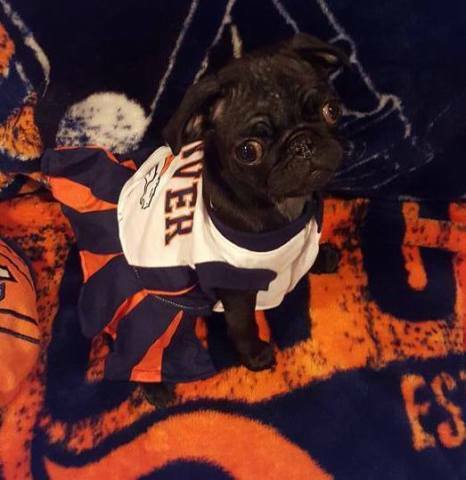 This pug puppy is ready to shake her pompoms for the home team! Lean to the left! Lean to the right! Stand up Broncos and fight, fight, fight! 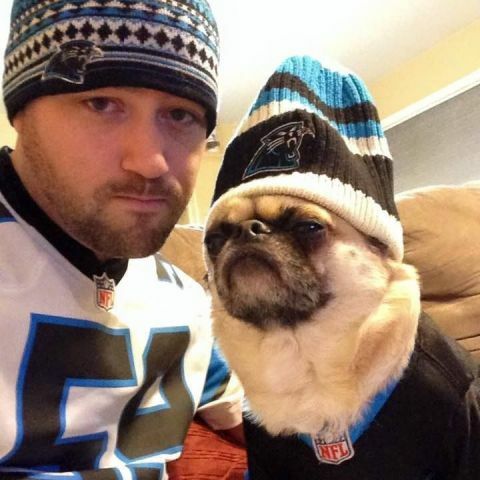 This pug apparently chose his human for being a Panthers fan. Pug and Dad are ready for the day, the game, and the par-tay! 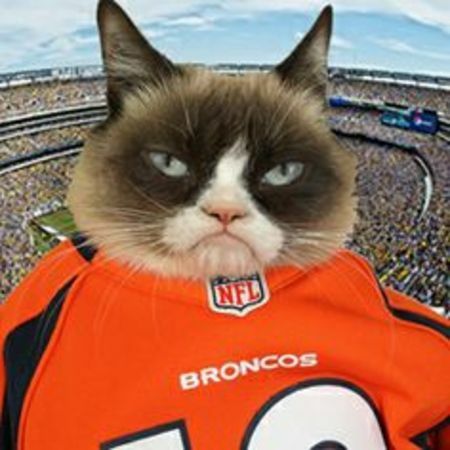 Even Grumpy Cat is getting into Super Bowl mode, though she really doesn't give a rat's backside about who wins. However, if ya gotta take sides, go with the horse. No need for more cat competition! One of the most important roles of a cat fan during the Super Bowl is that of lap buddy. This can be a vital task on a cold winter day. It also positions the cat to retrieve any spilled food. 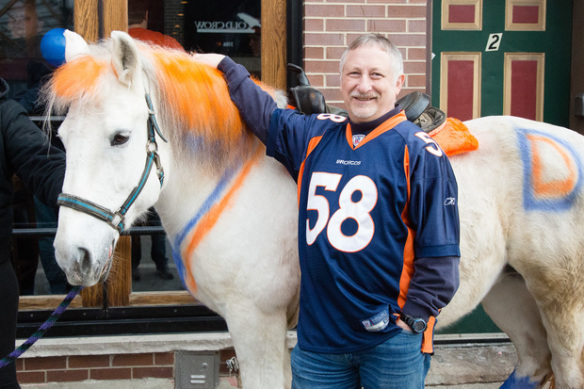 It should come as no surprise that one of the animals ready to root for the Broncos on Super Bowl Sunday would be a horse. The surprising thing about these Broncos fans is that they are in Chicago. 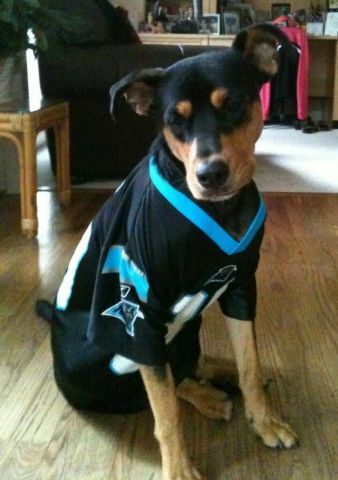 Kira is showing her Panther Pride while wishing for some really good Super Bowl snacks, like maybe some boneless chicken wings or those yummy meatballs. Since she is watching her diet chances are she will just get a couple of treats for her cheering efforts. 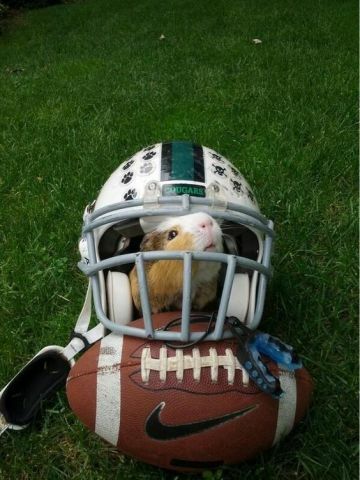 Naturally there will be plenty of people out there watching the game who haven't committed themselves to one team or the other, like this adorable guinea pig. He's just a huge football fan no matter who is playing! There you have it. 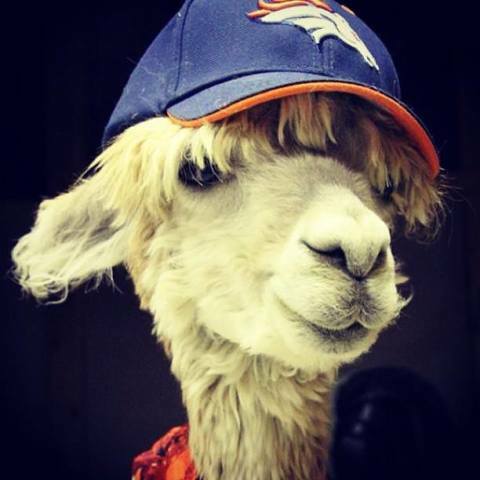 Animals that may be more ready for Super Bowl 50 than you are. And, in case you were wondering, I will be rooting for the Denver Broncos. No offense to the Carolina Panthers, but I live in the Denver Metro area and I've got to cheer on the home team. Go Broncos! Houston! We Have A Problem! The Animal Video Of The Day!! !